Do you provide automatic backups for my BladeVPS? Log in to your control panel and click 'BladeVPS' followed by the name of the desired server. In the top right, click 'Manage'> 'Backups'. 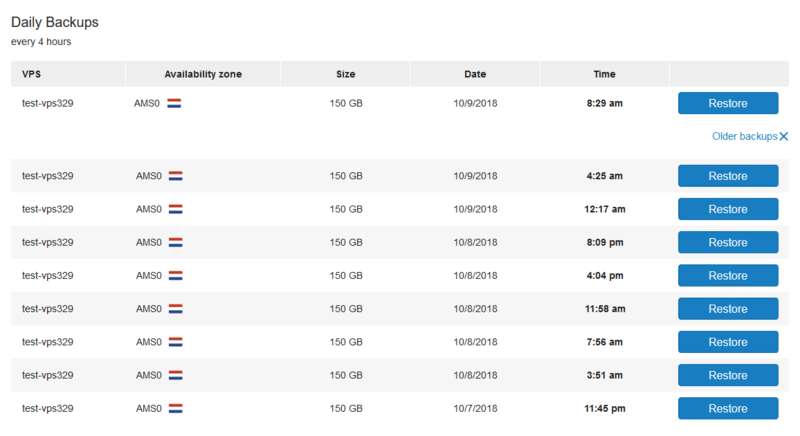 Click 'Older backups' for a complete overview of the available backups and 'Restore' to restore the desired backup. These are complete copies of the content of your VPS at that time and you can only restore the complete backup. This is NOT a backup of individual files (where you can choose which file or folder you want to put back), for this, you will always have to create your own backups. Please note that new files that have been uploaded or modified after the time of the backup will also be overwritten when you restore them! 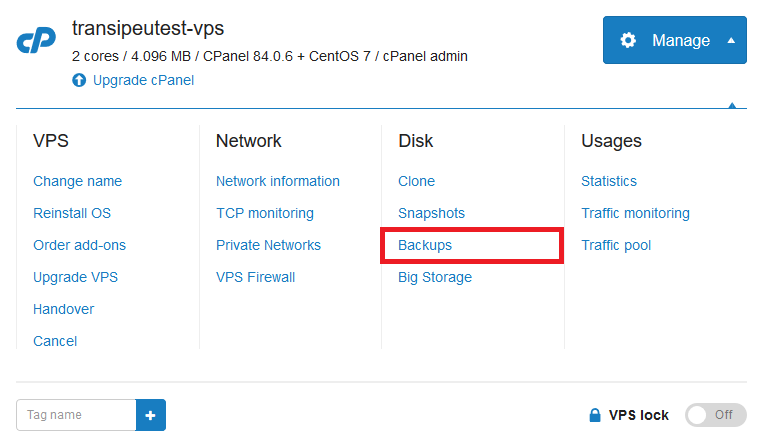 In addition, it is also important to realize that the VPS is switched off during the backup. When this process is complete (a progress bar will be shown) your VPS will start automatically, and you can fully use your VPS again. Backups and snapshots are essentially both a 'ZFS Snapshot' (the technique we use to create snapshots). The difference, however, is that the 'backups' are automatically made every 4 to 6 hours and are automatically overwritten after some time. This is very useful for a short-term backup when something has gone wrong unexpectedly. If you want to have a longer retention or to create a planned backup (e.g. just before a change / upgrade), then a snapshot offers the best solution. Snapshots can also be placed on other VPSs, which is not (yet) possible for the automatic backups. In the top right, click on 'Manage', followed by 'Backups'. You can order offsite backups at the bottom of the page that appears.